What is the Alfa Romeo Cloverleaf? 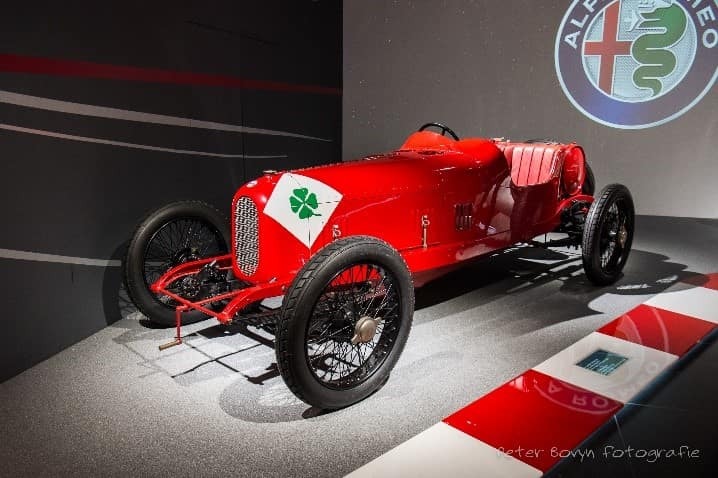 Dating back to 1923, the Quadrifoglio — Italian for “four-leaf clover” — made its first appearance on Ugo Sivocci’s Alfa Romeo race car at the Tara Florio open-road endurance race. Thus began the deep-rooted history of the Alfa Romeo cloverleaf. Sivocci’s Alfa Romeo RL bore the four-leaf clover, which he hand-painted on a white diamond background. Aside from the folklore of being a good-luck charm, the cloverleaf was a way for spectators to identify Sivocci on the course. Fans of the Alfa Romeo racing team were able to identify his car at a great distance, even through the dust of the race track. In an unfortunate turn of events, Sivocci had been test driving a race car at the Monza Circuit that did not bear the Alfa Romeo cloverleaf badge. Ending in tragedy, Sivocci crashed the car and ultimately lost his life. After that day, his good-luck charm became a symbol for uncompromising passion and dedication in the world of international car racing. Alfa Romeo gained its first Grand Prix World Championship in 1925. The race team then went on to win numerous racing titles, including the coveted Formula 1 title in 1950 and 1951. These victories are a mere glimpse of the Alfa Romeo racing history but have become an integral part of each model that features the Quadrifoglio. Showcasing the best in luxury and innovation, the Giulia Quadrifoglio and Stelvio Quadrifoglio represent the new ambitious era for Alfa Romeo. Both models include features that are specifically engineered for the Quadrifoglio trim level. From a Twin-Turbo V6 engine, over 500hp, and ultra-light materials means the cloverleaf is more than just an emblem from the Alfa Romeo history. The Giulia Quadrifoglio is the sportiest Alfa Romeo found on the road today. The design is unmistakable as an Alf Romeo and reflects years of luxury and quality. The Alfa Romeo Stelvio Quadrifoglio is an SUV unlike any other. Incorporating road race engineering, the model was created for consumers who seek the highest level of performance and utility. Both models encapsulate the passion for luxury driving at top speeds that began with Ugo Sivocci.